I was recently invited to participate in an appraisal fair at a local American Legion. One of the participants brought in a baseball with several HOF autographs, looking for an opinion. I advised that my subject matter expertise is limited, but offered to post here to try and get some opinions on value. 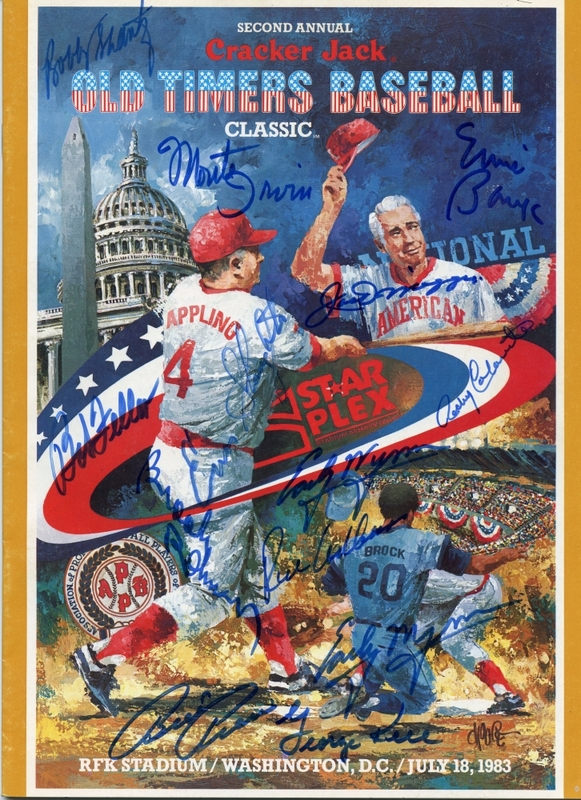 The baseball itself is a Worth marked "NATIONAL OLD TIMERS CLASSIC". I realize there are a lot of these group signed baseballs out there, and the value will depend on the signatories. The owner of the ball is not looking to sell, but was asking for an opinion of value. I told him I would post to this forum to attempt to get a better idea of value than I could provide on the spot at the event. Any help would be appreciated...Thanks! Last edited by OHAuctioneer; 01-29-2018 at 12:33 PM. 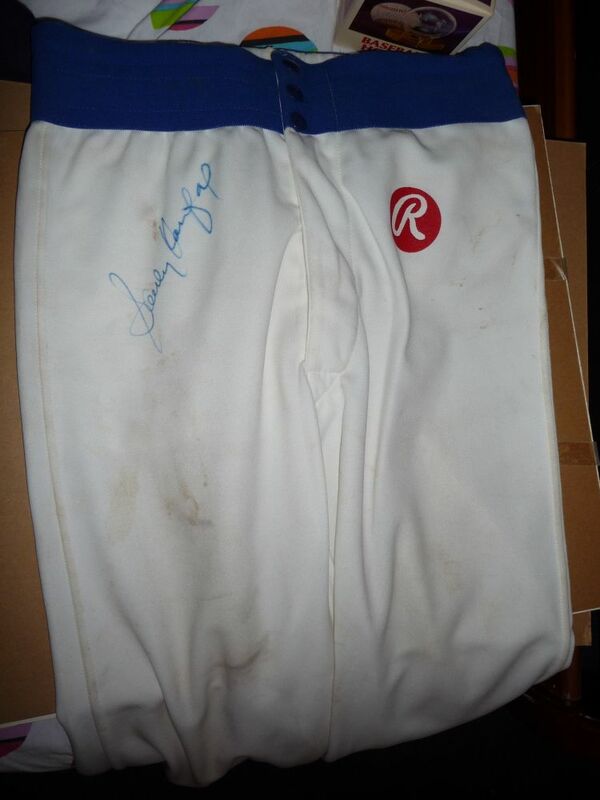 signed at the dinner, or quite possibly at the HOF Old Timer's game. 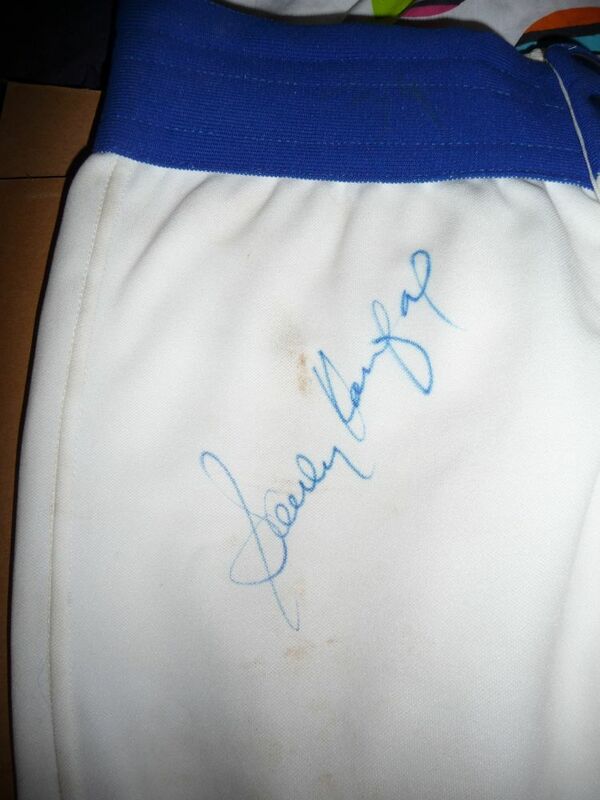 I love the Appling as it looks like his shaky later in life signature. If one is good it would be weird if they all weren't considering the story. Good Luck! Jerry Neudecker was behind the plate for Hunter's perfect game. Without having the ball in person, those signatures REALLY look printed on. Not signed. I was just going to post the same thing...lol. Would be an odd grouping to have pre-printed on a ball. 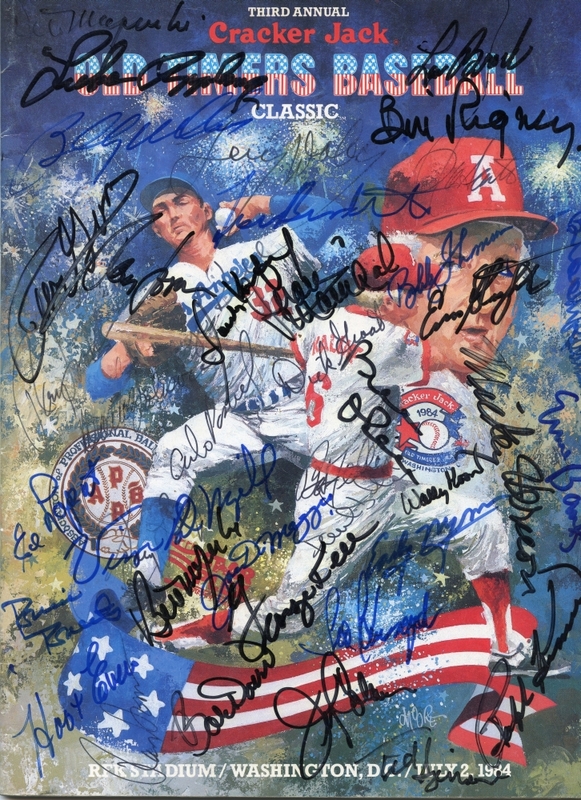 Assuming the signatures are not pre-printed, I would place the value at $150-200. The DiMaggio being the only reason it would be that high. I appreciate the feedback received so far. Having seen the baseball in person, I believe they are authentic and have no reason to suspect that the person who brought the ball in would be making up the story as to how the ball was obtained. Maybe someone could enlighten me as to how multiple signatures could be printed on a ball. Would they have been printed individually in random locations or all at once on each panel? If that were the case, wouldn't there be duplicates out there? I've seen printed autographed balls, but to me, these look genuine. The I've attached a larger picture of one side if that helps. Thanks again for the opinions...please keep them coming! Last edited by OHAuctioneer; 01-31-2018 at 01:11 PM. Looks like a signed souvenir ball from the Cracker Jack Classic baseball games ( remember when Appling took Spahn deep in Washington DC ?). I don"t think it is pre-printed unless this was a souvenir ball with select player's signatures ( not all the players competing ) on it to be sold. It is an odd collection for a pre-signed ball IMO . It is definitely from one of the Cracker Jack Game in DC. I have a ball from one of those games as well, but with the logos in red print ink. I cannot recall any preprinted stuff from those games and think it is real. Unfortunately the balls were not the good leather of the pro Rawlings balls and my signatures have almost faded away. I don't have a photo of mine as of now, but have a few things from the games. I attended the games as a member of the press. 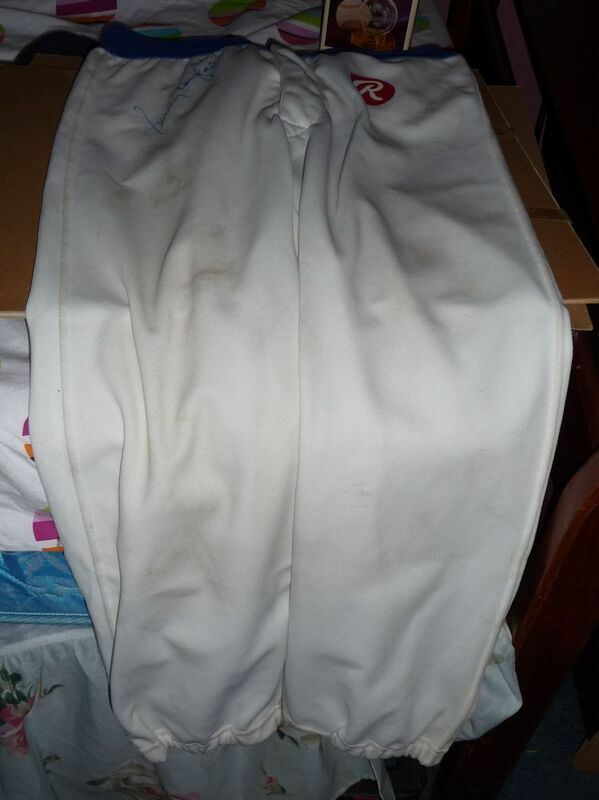 Sandy Koufax Pants from the game he played in. He gave them to me himself, and signed them, in the locker room. I asked for his jersey, but he had already given it to someone else. Programs from each of the 3 games with sigs I got at the time. Unfortunately, I think the sentimental value is probably worth more than what could be gotten on the open market. I would guesstimate a couple hundred dollars at best. I have found that multi signed balls outside of team balls or special theme balls, like 3000 hits, etc don't sell for as much as people expect. Unfortunately, no one on the balls is so rare that it makes it super special. IMO, most people who want Joe D on a ball would prefer a single signed version. That's one thing I did mention at the appraisal fair...that multiple signatures on a ball are not necessarily additive, and that it could be less valuable than some of the autographs individually. The program covers you pictured are very nice, and even though they were from different years, it looks like a number of the players tended to participate year after year, as I recognize several of the players from the ball I posted. Last edited by OHAuctioneer; 02-01-2018 at 06:54 AM. Just a note about those Old Timers games. 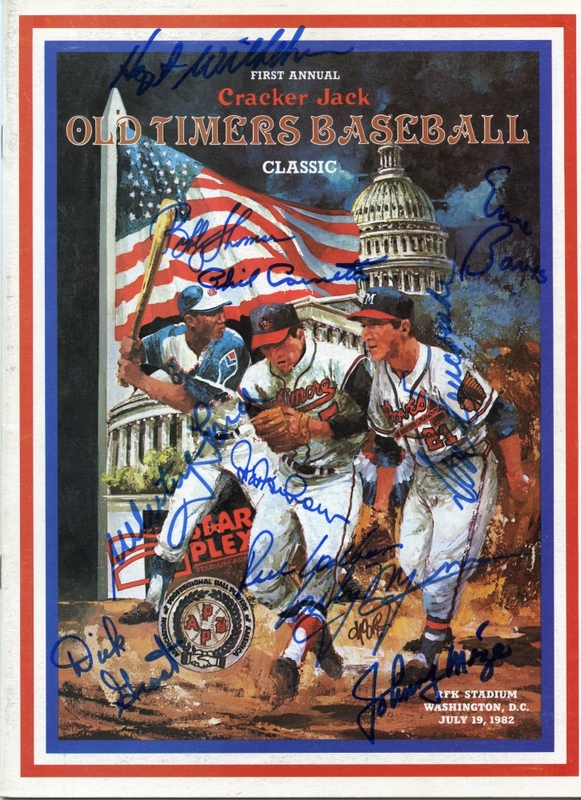 They started out in Washington, DC in 1982 with Cracker Jack as the sponsor, and they were known as the "Cracker Jack Old Timers Baseball Classic." The balls used in those games actually had that full name printed on them. After six years, the games were moved to Buffalo for a couple of years and Cracker Jack no longer sponsored them. Given the lack of "Cracker Jack" on the ball, my guess is that it is from one of the games played in Buffalo. Also, I don't think those are stamped signatures.